All politics are local, even for the leader of the world’s superpower. NATO angst over Donald Trump’s embittered unprofessionalism is only feeding the perception in his domestic audience that the United States is unappreciated. Two years into his presidency, Donald Trump has left no stone unturned in the global defense establishment. There have been successes: After a chemical attack by the Syrian regime killed 80, Trump marshalled the U.K. and France for a concerted response, the second use of force of his presidency, and a rebuke to Obama’s idleness over images of children dying by asphyxiation. Trump’s North Korea policy has yielded progress of a sort. After seventy years of war-rhetoric, another summit between the two Koreas has happened, almost becoming routine. Astonishingly, the North Korean leader has dropped his demand of a U.S. troop withdrawal as a pre-condition for denuclearization of the peninsula. There is talk between the three countries of a permanent peace treaty to end the Korean War. President Moon of South Korea called for Trump to receive the Nobel Peace Prize. But in July, the U.S. president Donald Trump visited Europe for the NATO allies’ annual summit. The bombastic American roiled the summit by criticizing host Germany and demanding the continental allies meet their goals of 2% of GDP for defense funding or face cuts in the U.S. commitment. Trump critics have lambasted him for his criticism of NATO and particularly Germany. European Council President Donald Tusk took Trump to task, tsk-tsking that America should “appreciate your allies, after all you don’t have all that many.” But what of Trump’s accusations that European NATO members don’t spend enough on their own defense, and are making trade deals with its enemy, Russia? Presidents Obama and Bush both pressed Europe to increase their defense spending as well as diversify their security capabilities. The GDP of the European Union is about 19 trillion USD. The United States is about the same. However, the U.S. spends 3.57% of its GDP on defense, while Europe spends just 1.95%, down from 3% in 1989. A whopping 70% of the NATO defense expenditures comes from the U.S.! Even more than the disparity in dollars is the disparity in capabilities. In 2014, President Obama began the European Reassurance Initiative (ERI) in response to the Russian annexation of Crimea. That fund has been increased to 3.4 billion USD. With one armored brigade rotating through training in Europe, and an additional two brigade’s worth of pre-positioned stock, the U.S. is committed to a division plus of real kinetic power on the ground in the event of conflict with Russia. That division would have 300 tanks, ready to roll, not to mention the attack helicopter battalion presently stationed in Europe, along with the rotational aviation brigade with another attack battalion. Germany on the other hand reported only 95 of its total of 244 Leopard tanks (in all of the German Army) fully mission capable at the beginning of 2018. This begs the question: Is the U.S. overcommitted to defense in Europe, when Europe is doing business with the enemy from which it demands protection? Germany currently gets about 1/3 of its natural gas from Russia. The billions of dollars invested in a new pipeline to bring gas from Russia could increase the share to half. Memories are very short indeed if Europeans forget when Gazprom halted gas deliveries in January 2009. Outwardly, the gas stoppage was about signaling Russian dissatisfaction with Ukraine’s request to join NATO. In the event, Russia would invade and effectively partitionthat country in 2014. European dependence on Russian gas only makes sense when U.S. security commitments are taken into account. The forward positioning of U.S. military assets in Europe still serve the same deterrent effect as during the Cold War. U.S. bases in Europe, many in Germany, provide assurances that life there can be as comfortable as their governments can make with negligible sacrifices of their own. It is common knowledge that both Obama and Trump have signaled a reluctance to use U.S. force to make things right in the world, a lesson learned by both during the catastrophic invasion of Iraq in 2003. In April, Trump ordered the Pentagon to plan for a complete withdrawal of U.S. forces from Syria while Trump’s national security advisor, John Bolton and Secretary of State Mike Pompeo work to organize an Arab coalition to take over security operations in the devastated country. Trump has toyed with the idea of reducing U.S. troop presence in Korea to save money, an idea increasingly difficult to disregard as the two Koreas build a better rapport framework. Through foreign policy successes and failures, there has been one constant in Trump’s security policies: Reduce the cost of defense. It is through the lens of defense economics that Trump’s recent tariff increases on his erstwhile allies should be seen. He will make the argument that Europe is finally paying more for its defense, the same as a revamped NAFTA in a way makes Mexico pay for the border wall. The billions reaped from lower defense spending would be used for multiple purposes, from paying for tax cuts for Republicans to social programs for Democrats. If the U.S reduced their own defense spending to European levels, it could achieve massive change in America, as this article by Jeff Stein makes clear. Both the right and left in American politics are increasingly vocal in demanding the redress of social ills in America. From health care to rebuilding an outdated education system, trillions of dollars would eventually be needed. Trump has been astute enough to be strong on defense, but understands that his core base thinks its time for Liberal countries to begin paying their own way. In that, he is feeling his way forward on reducing his European defense expenditures to spend the money elsewhere. 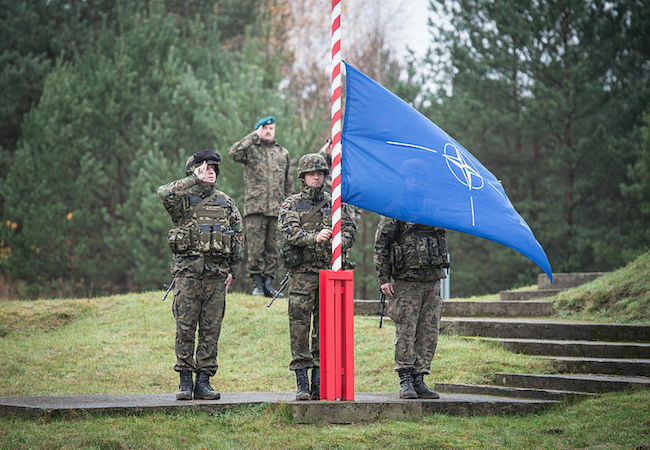 NATO’s problem is not the rightward lurch in American politics though. The problem is that finally, the left and right are uniting behind the idea that the Liberal order sustained by U.S. might for seventy years no longer is providing dividends for the masses. While it seems ever more likely that the Republican Donald Trump will be replaced by a democrat in 2020, this may not bring the relief that Europe seeks. Trump, from the right of American politics, has called for lowering defense spending in Europe. This smashing of a conservative shibboleth makes it that much easier for a 2020 democratic administration to support the alliance and Liberal order, while making the same demand that Europe pay more. This will likely happen. The European and NATO elites, long lulled senseless by their global and regional hegemony, have forgotten that all politics are local in democracies. Phil W. Reynolds specializes in security studies and consults with the Center for Future Studies at the University of Hawaii. He lives in Washington, D.C.